ОТЕЛЬ PULLMAN СОЧИ ЦЕНТР 5*. Официальный веб-сайт. 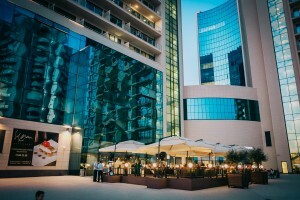 The 5-star hotel Pullman Sochi Centre is a part of the new multi-building complex, including another Group’s hotel Mercure Sochi Centre and Russian International Olympic University. With 150 rooms and suites ranging from Superior to Presidential, Pullman Sochi Centre makes sure that every need of each traveler will be met to the highest of standards. All of these rooms include a private balcony where you can enjoy the fresh air while taking in the breathtaking view over the sea. Offering an amazing view over the Black Sea, it is perfectly located minutes from the seaside, business district and shopping area of the Central Sochi. The hotel can be reached easily either from the Adler International Airport (30 km) or from the Railway Station (2 km). Pullman is the executive lifestyle upscale hotel brand of AccorHotels Group: a new generation of hotels for a new generation of mobile, hyper-connected customers. Over 100 of Pullman hotels and resorts welcome international, cosmopolitan seasoned travelers from all over the world for business and leisure stays. The hotel is proud to present one of the biggest conference centers in the city that can accommodate any type of event. For guests to relax after a business meeting or busy day in the city, the hotel offers its guests to enjoy the gourmet Mediterranean cuisine at the award winning Sel Marin restaurant with summer terrace, 24/7 bar O’Bar, and Fit and Spa Lounge on 16 floor as well as inside and outside pools. Pullman’s warm expert welcome and customized offers and services provide its guests with an innovative, efficient hotel experience for guests who travel for business, corporate incentives, meetings, culture events and family vacations. In early June, the hotel will open its own beach. A closed safe area, modern equipment and the sound of the sea. Enter with Pullman Sochi Centre the new realm of business travel and attain perfect symmetry between your work and leisure. The Hotel Pullman™ Sochi Centre 5*. Official website. Always interesting offers and special benefits and rewards! Would you like to get special offers, news and stories about Pullman? Please leave your email and be rewarded! Keep track of our latest news!